I've written before about the wonderful glass spheres that our good friend Jeanne gave us as presents. During the evening they brighten things up, and make a flickering glow on the ceiling reminiscent of winter's woodstove firelight (but without the heat). Bunny was born in 2003 when my float garden was new. Wayne brought him to the cabin at Easter that year, and Bunny has lived there ever since. Living outdoors 24/7 can be tough. In 2008, Bunny came indoors for a short stay and some reconstructive surgery. This year, Bunny came in for a facelift. His plywood back brace was a bit curved, but still sound. Over the last six years (that's so hard to believe), his colours have yellowed and faded. A repaint front and back returned Bunny to his former glory. Powell Lake flows from rivers and glaciers in the Coastal Range through the short (only 500 metres or one-third of a mile long) Powell River into the Strait of Georgia near a town bearing its name. Powell Lake is 51 kilometres (32 miles) long, has 480 kilometres (300 miles) of shoreline, and is 1,180 feet deep in the lower basin. Come take a ride with me up the lake from the Shinglemill marina to the head of the lake. 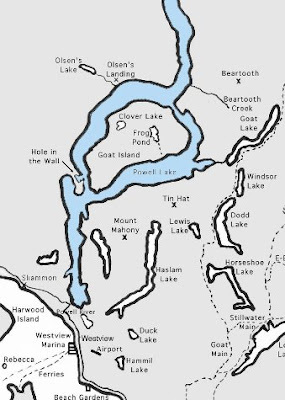 Powell Lake was created when glaciers scoured out its fjord. After glaciers retreated 10,000 years ago, the land rose and sea water was trapped. Fresh water on top did not mix with the heavier salt water below. 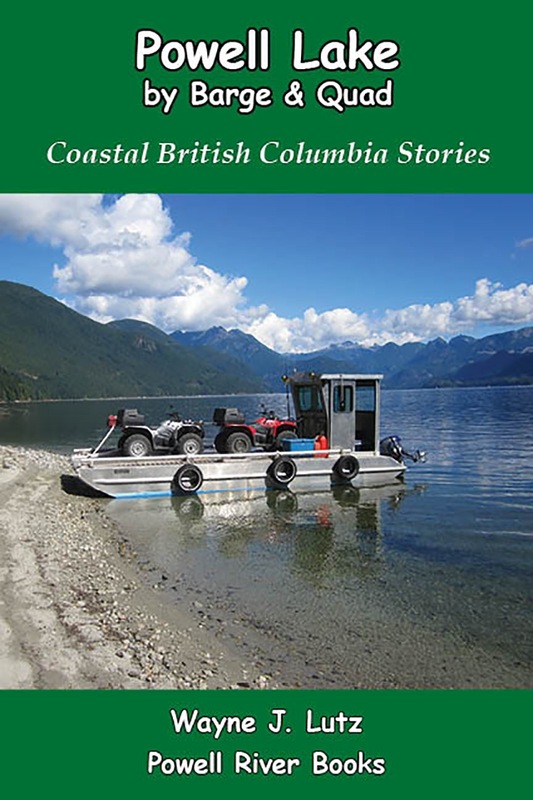 Click to read about our water sampling and UBC research. Heading up the lake the first thing you notice is float cabins dotting the shore. The farther you go, the more you see. There are about 250 cabins on the lake in total. A moratorium in 1998 limits expansion and keeps our lake pristine. As you proceed to the end of the lower lake, you spy tiny Cassiar Island in the distance. Tuck your boat behind and get protection from what our friend John has named the North Sea. That open stretch can get some pretty big waves. 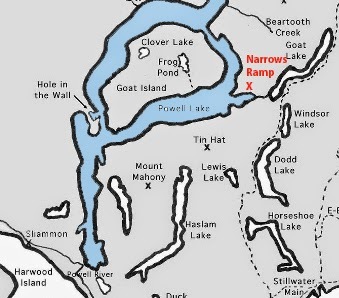 In the middle of Powell Lake is massive Goat Island. It rises abruptly in the south, but the north end has the highest granite bluff, home to mountain goats. 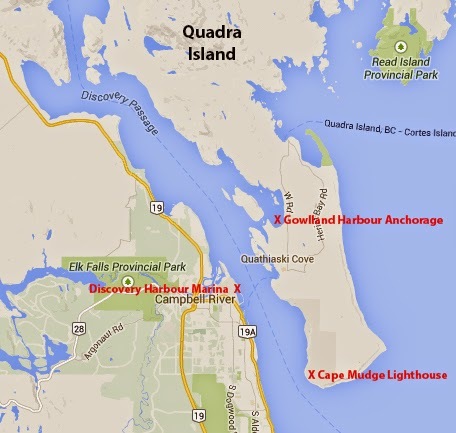 Stop in First Narrows between the south end of Goat Island and the mainland shore to fish for some trout for dinner. 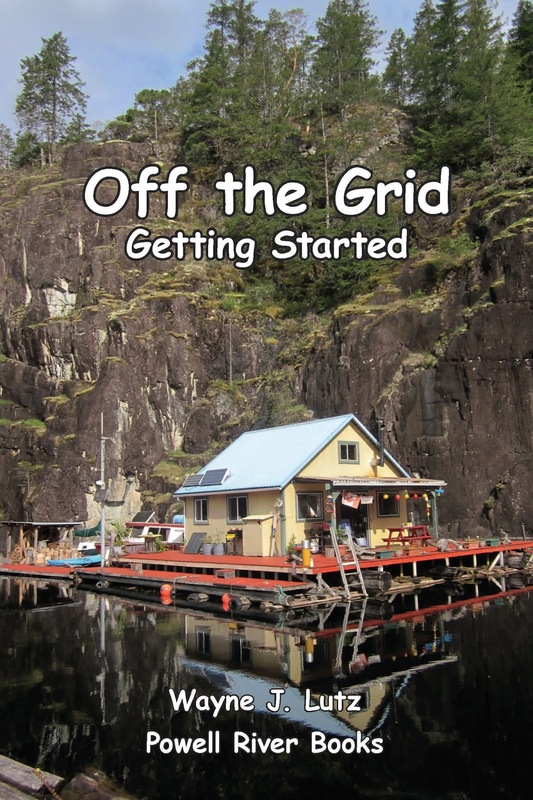 Just past First Narrows is the entrance to Hole in the Wall, our float cabin's home. Today we are going to continue up the west side of Goat Island towards the head of the lake. On the way, keep an eye out for Elvis, crooning away on a point named in his honour. As you approach the northern end of Goat Island, stop at Olsen's logging dock for a stretch break. From here you can see Second Narrows at the North end of Goat Island and the high country beyond. Get back in the boat and head straight for the snow capped peaks ahead. Bear to the left and you are almost to the head of Powell Lake. Come in the spring for spectacular waterfalls. This is an active portion of the lake, so keep your eyes open for tugs moving equipment and logs. At the Head, you might even get to see trucks dumping their load into the holding pens, ready for market. At the head of Powell Lake the Powell River begins it's journey to the sea. Up Olsen Main from the Powell Lake logging dock you'll find lovely Olsen Lake. On a recent quad ride, we stopped here for a rest break. This area once boasted a thriving community of hardy homesteaders. Residents made a living growing crops to sell to the logging companies in the area. Today there's little evidence of their existence. Water from nearby Theodosia River was diverted through Olsen Lake to increase the flow into Powell Lake for the hydro-electric dam at the Powell River paper mill. Efforts at restoring the original flow have begun. The day we were at Olsen Lake it was so calm that the high country beyond distant Powell Lake was reflected on the surface. When Wayne and I pulled into Gowlland Harbour on the southwest coast of Quadra Island to anchor for the night, we discovered a welcoming committee of one. As we swung on our anchor in the placid water, this harbour seal came to check us out. I'm not an expert, but I am pretty sure this is a harbour seal because it has no external ears. They can be found along the Pacific coast from Alaska to California. We often see them in anchorages playing, feeding, and lounging on rocks. It always amazes me that mosquitoes can find me even when we anchor our boat in salt water quite a distance from shore. The little beasties make their way to dine on my exposed parts. I must be one of the one in ten who are highly attractive. Even worse than their bite is the incessant buzzing. WebMD.com says only the females bite. Blood is needed to develop fertile eggs. And to make sure they can find what they need, female mosquitoes can smell their target from 50 metres away. That's a whopping 164 feet. No wonder they can find me. But once they zero in, Wayne is the unlucky co-recipient of their attention. Our Bayliner 2452 has screens on the windows, but on a hot summer night it's nice to open the forward hatch to get some air flow going. I went to the hardware store and got some fiberglass screen and the craft store for some sticky back Velcro. With those two items and some Gorilla Glue, I fashioned a custom hatch screen. I chose sticky back Velcro because it's easier to use than sew-on. To make sure it adhered to the porous screen, I added Gorilla Glue between the two sides. Rather than clamping it, we used body weight to set the glue. Because the ceiling of the boat is covered with carpet, only the hook side was actually needed. I went ahead used the loop side to enclose both sides of the screen. Back in 2008, we took an old propane tank and turned it into a whale to ride the waves next to the log boom at our cabin. Over the years, riding in the water and rubbing on the logs removed some of his paint and allowed rust to return. Wayne brought Mr. Whale in to give him a redo. First, the bottom was painted with several coats of primer. Then his painted surface got a touch up. Fortunately, we saved all of the old paint and it was still in good condition. Once Mr. Whale was finished, he got a boat ride back out to his place of honour on the log boom. There he swims in all seasons, and greets neighbours and visitors (we call them lookie loos) that come in and out of the Hole in the Wall. One of our first cruises on the chuck (ocean) this season took us to Gowlland Harbour on the southwest tip of Quadra Island. 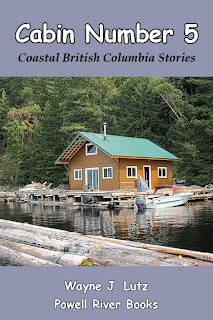 From the Strait of Georgia to the south, you reach Gowlland Harbour through the Discovery Channel that runs between Campbell River on Vancouver Island and Quadra Island. Entering the channel, you pass the Cape Mudge Lighthouse. The weather observing and reporting, light and fog horn have been automated. The passage can develop strong currents, eddies and whirlpools as the tide is compressed through the 25 kilometre (14 mile) long and 2 kilometre (1.2 mile) wide channel. About half the way through you will find the entrance into protected Gowlland Harbour on the right between Steep and Gowlland Islands. The anchorage is protected by a ring of islands and the curved shore of Quadra Island, but when northwest winds blow there can be a bit of chop. You can tell this is a protected spot from all the log booms tied and waiting along the west shore. We motored slowly to the head of the bay and dropped our anchor in 35 feet of water. The bottom here is muddy with good holding. Because it was June, we were the only boat in this portion of the bay. If you don't like to anchor, there is moorage available at the SeaScape Resort on the east shore. They also offer power, showers, resort accommodations, and kayak rentals. After a pleasant evening, we got up to fix a quick breakfast before heading over to the Discovery Harbour Marina at Campbell River to get fuel and visit the adjacent shopping mall to resupply the boat with some good things to eat. Last week I saw something for the very first time, a mother Common Merganser with her ducklings in tow. Rather than swimming behind mom, they were either on her back or linked up trailing behind. This Merganser swam by our cabin with about eight ducklings lined up behind. I was intrigued, so did some online research. Mergansers lay from 6-17 eggs. 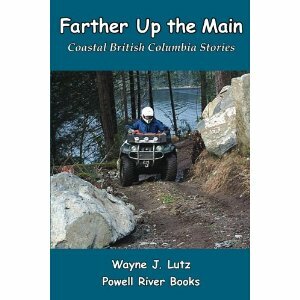 Last weekend we went for a quad ride on one of Powell Lake's logging road systems. Logging companies open up the backcountry for their own purposes, but they also provide a great service to recreational users who want to get through dense forested areas to enjoy nature and reach high points for immense vista views. Using a new (to us) barge, we were able to take our quads to the Narrows dock and ramp near where Goat River empties into Powell Lake. This is not an active logging spot at the moment, so we were able to unload and then park the barge at the nearby dock. We ended up camping for the night to make it a two day adventure. The logging roads lead through forested areas about 100 years old, and slashes that are in a wide range of regrowth from current plantings through trees already decades old. 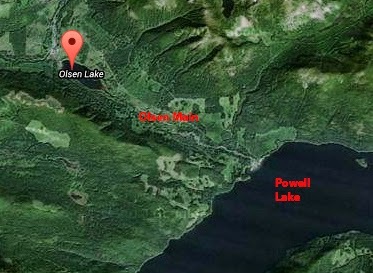 The Western Forest Products Stillwater Forest Operation encompasses the land surrounding Powell Lake. Click here to see online maps of the region. Care needs to be taken when using logging roads. 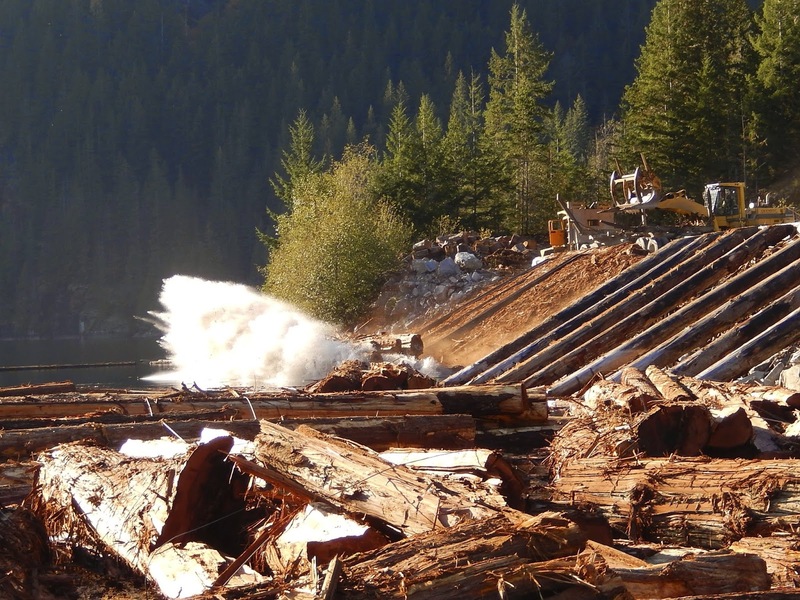 Western Forest Products has a 24/7 hotline at 604-485-3132 where you can get up-to-date information about logging, road building, and hauling activity. This is my most recent bread baking experience. We enjoyed the flax bread I made last month. This time we wanted a lighter one for toast and croutons. I chose a recipe from my Fannie Farmer Cookbook and cut it in half for one loaf. Heat milk and oil to lukewarm. I used one small can of evaporated milk with water to equal the full amount. Evaporated milk is easy to keep on hand off the grid. Mix 1 cup wheat and 1 cup white flour with yeast, salt, and sugar. Beat in liquid ingredients for 2 minutes. Add remaining cup of wheat flour and beat until well mixed. Add as much white flour as needed to make a soft dough that pulls away from the bowl. Turn out on a lightly floured board and knead several times. Cover and let rest for 10 minutes. Knead for 10 minutes until smooth and elastic. Use white flour as needed to keep the dough from sticking to the board. Place in a greased bowl and turn over to coat all sides to keep it from drying. Cover and let rise until the dough doubles is size. This time of year I use the pilot head in my oven. Punch down and shape into a loaf. Place the dough into a greased 5 X 9 inch pan. Cover and let rise again until doubled in size. Bake at 375 degrees for 45 minutes or until golden brown and hollow sounding when tapped. Remove from the pan to cool on a rack or turned sideways on the bread board. I'm not an expert bread baker. In fact, I'm quite a newbie. But it's fun to stretch my skills to become more self sufficient. It takes 25 minutes each way to get to the marina and another 15 minutes to drive to the store. Plus the cost of gas and our carbon footprint. Baking at home between trips makes a lot of sense.